Summer is a crucial time to keep your backyard birds supplied with water for drinking and bathing. Birdbaths set at different heights serve a great variety of birds. 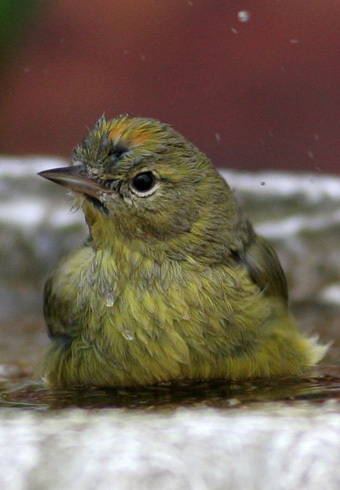 A wide, shallow birdbath that deepens a bit in the center will suit a broad range of birds - including this Orange-crowned Warbler. Most important of all? Keep it clean! You can learn more about birdbaths at Cornell's AllAboutBirds. Your local Audubon can help, too. The summer season is generally the driest of the year. Creeks run low or underground. Rain is scarce, and temporary puddles gone. Summer is a crucial time to supply your backyard birds with water for drinking and bathing. Birdbaths set at different heights serve a great variety of birds. Some shy birds come readily to a birdbath set flat on the ground, but will rarely visit a birdbath on a pedestal. Leave those for the more bold bathers. Water depth is important, too. Many birds prefer shallow water over deep. An inch of water – or even less – is ideal for small birds. A wide, shallow birdbath that deepens a bit in the center will suit a broad range of birds. A fine dripper or a mister on a birdbath is also a superb idea. Not only will it keep the vessel full with little effort, but small birds like hummingbirds often prefer a refreshing shower. Many birds find the drip – drip – drip of the water inviting. Learn how to create a backyard sanctuary for birds and other wildlife. Begin at our website, BirdNote.org. I’m Michael Stein. Bird songs provided by The Macaulay Library of Natural Sounds at the Cornell Lab of Ornithology, Ithaca, New York. American Robin and American Goldfinch recorded by G.A. Keller. All About Birds has more about attracting birds to your yard!